Mobblo:  Dungeons & Golf World - New 2 event tours for April 28th! Dungeons & Golf World - New 2 event tours for April 28th! Only 1 hole in Giant Head! 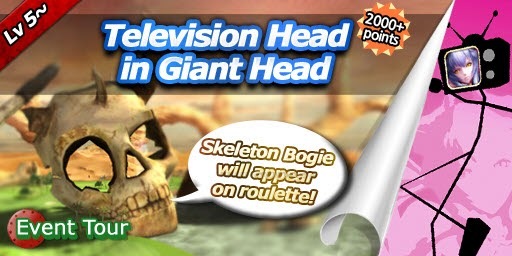 All you have to get is eagle to meet the Skeleton Bogie on the roulette! The winner's prize is Orichalcum Club Set! And the all-birdie prize is 1 Oil Ball! Which Golfy will show up on the roulette? Well, it is defend on how much points you get from the tour! 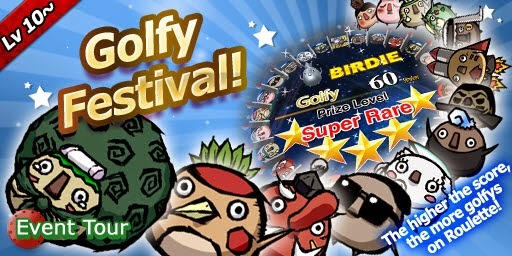 What score you get, you will see the golfys in 4 to 22 slots! The winner's prize is Mithril Club Set. And the all-birdie prize is 1 Surfer Golfy.